World economy crisis? That's what we see and hear on TV and newspapers every day. If you follow the eco solution programmed lifestyle, there should be no fear of food shortage at all. More than 20 years back, our group moved to the Philippines far from Japan to cooperate for Eco Solution Program. At first, we started to find wasted vacant land to plant trees and vegetables for survival reason. Today, several hectares of wasteland have been converted to produce tons of fruits, vegetables and enough daily crops for poor natives of rural land under self-supporting program. I remember 60 years ago, when entire Japan was at the peak of food shortage. We ate any available green leaves such as dried sweet potato leaves and tops, soft portion of squash leaves and flowers, any edible grasses in the field, small amount of soybeans, and desiccated coconut powder imported from Philippines. At least, we were able to survive and miraculously with healthy condition. We realized today that these vegetables we hate to eat have more nutrients and healthy properties compared to modern foods we prefer to eat today. Yes, that's right. We Japanese were able to survive with splendid brain functions out of sweet potatoes. Thus, let's think on how to escape from food shortage if you are wise enough to think a simple grass that can grow anywhere in your small container garden. 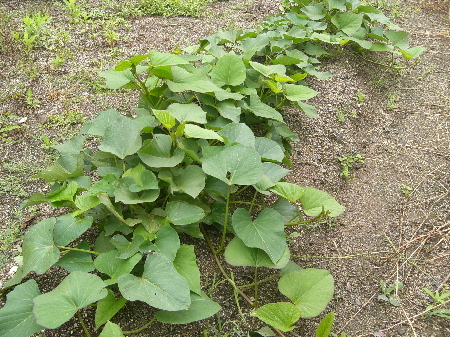 Sweet potato leaves and tips are abundant especially in developing countries. Sweet potato has roots that are high in calories and vitamin A, and the leafy tops are eaten as vegetables. According to some information I learned, this may be the only plant with iodine, and that one of its many medicinal properties is its ability to lower blood sugar and cholesterol levels. 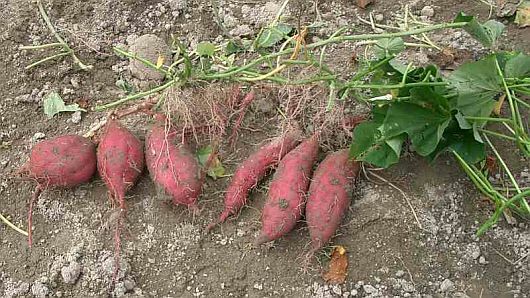 To support family income, the root crop of sweet potato can be sold, and the leaves and tops are for your consumption. How do we preserve leaves and tops (stem) for a year? Just boil cleaned stems for about three minutes. The color of leaves and stems turn to strong green. Dry it under the sun. You can preserve it as long as you want. When preparing it for cooking, soak the dried sweet potato leaves in water to reconstitute. Now, you can cook it just the same way you cook other vegetables. That's what we did during the food crisis in 1940s. And we still maintain the same way of lifestyle. It is a very friendly and healthy eco solution. You can apply the same method not only to sweet potato leaves and tops, but also to jute leaves, Moringa leaves, taro roots, sugar cane and other nutritious leaves and stem products. You can find various nutritive eco solution vegetables in our other health articles. Then, how come the world complains for the lack of food especially in some parts of Africa, Cambodia, Laos, Vietnam and other Latin American countries? They are just lazy to work, aren't they? Or are they busy fighting each other just like Filipino people in Southern Philippines? Six of our people live in the rural part of the Philippines, and we almost have self-sufficient food production with the eco solution programmed lifestyle. We bake bread and cake out of grinded sweet potato, taro, squash, and cassava. We even make noodles out of them. Since we came to the Philippines, we never buy canned food. Goat and chicken are abundantly available if you are not lazy to take care of them and work. We just wonder why people here complain of food shortage.